I bought the Explorer 200PDS a while ago, but as you are asking for reviews, I thought I would add my two-penneth. 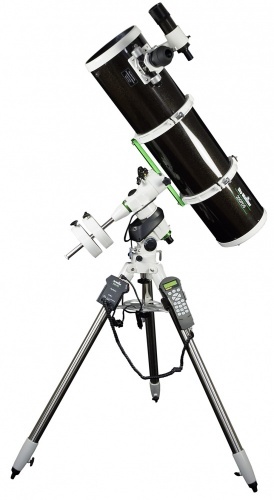 Firstly, I have to say that I think it's a wonderful scope, and for the money, well worth the investment. It has a short focal length, so I get lovely wide field views. Without a coma corrector, there is some distortion at the edge of the field, but with it, the view is superb. Nothing beats the lovely sight of the Orion Nebula in this thing. With the right eyepice, it fills the view wonderfully, and there's lots of detailed structure visible. My only concern is that I had a disastrous moment, where the telescope slid out of the mount, as I had not tightened it up properly. A screw at either end of the dovetail mounting bar would have stopped the accident. I would recommend anyone buying one of these to fit a couple of screws, just in case! All in all, I'm very satisfied with what is now my favourite scope.